If you thought spreading the word about your new blog or website was hard, you'll find convincing the world you're an industry expert may be even more difficult (at least in the beginning). As a solution, Help A Reporter Out (HARO) offers the opportunity to score press features, guest posts, or expert interviews so you can share your knowledge with the world. The end result may come in the form of quote snippets, full features, or ongoing editorial relationships and can help boost your authority and site traffic. If you are not subscribed to receive alerts from your industry, get on it! You likely turned to HARO to build backlinks to your website and features on high-reach outlets; your best shot at sifting through it all is organization. When you sign up for the media service you're automatically subscribed to a master list but, for many members, receiving queries in irrelevant categories can become overwhelming. Besides, if you have a vegetarian restaurant, for instance, yet pitch a reporter for a travel article on the best ski resorts, think twice -- the audience you want wouldn't read that article and the journalist wouldn't consider you an authority on the subject. The goal is to use an outlet's widespread reach to grow prospective customers in your niche demographic. Choose the right industr(ies) when signing up for HARO alerts, select how frequently you want to receive emails (HARO sends query reports up to three times per day), and get pitching! HARO opportunities often disappear as quickly as they come, as journalists have assignments with short turnarounds and sources may respond in droves. With 475,000 source members and only 35,000 journalists, you can see that the competition is high. When reviewing a query that catches your eye, the first thing you should pay attention to is the listing's deadline. Plan to submit a pitch within 12 hours of receipt (or less) -- even if the deadline is in a few days. Don't send a pitch if the deadline has passed. My recommendation: pitches should only take you about 15 minutes to write and if you're a beginner, no more than 30 minutes. Ever write a pitch and have no idea what to say in the email subject line? Don't overthink it: expect the outlet reporter to receive hundreds of notifications per day and set your subject line to be easily identified. On top of that, don't assume it is the journalist's only query or media outlet -- many of them are freelancers/contracted. My recommendation: stick with the summary text, along with a reference to the HARO category, the listing's respective media outlet, or your expertise. While other experts suggest you write a unique headline to stand out, as a source and journalist, I find it easier to search through received pitches when I know what term to search for! Many 'compelling' subject lines have gotten lost in the black hole of my inbox. Address the contact by name, if provided. Clear formatting if you've copied and pasted content. This isn't the time for curly fonts and colorful script (plus, there's nothing uglier than a pitch with AltERNATing fonts and sizes). To clear formatting, click on the ⦸ symbol in most email clients and it'll reset the highlighted text to your default font. Bullet points are your friend: help the reporter skim through your points. I learned to ignore my first suggestion and think deeper if I want my answer to stand out. Luckily some HARO queries allow you to offer more than one idea (if you keep it short) so not all is lost if you're adamant about following your gut. If you have time, Google-search their topic and omit redundant answers from your pitch. You get the idea by now: long pitches aren't the answer (unless advised). You know what else isn't the answer? Empty pitches like "I have a great idea. When are you available to discuss?" or "I know someone who is a great fit for your article. Are you interested in connecting?" or "I first fell in love with this topic at the age of 10; my mother always told me I was great at it." Write your pitches with the assumption that if the reporter loves it, they will publish right away based on what you said. Very rarely will a journalist reply and ask to do a deeper dive -- especially if they are featuring many experts. While you shouldn't deter from including an invitation to discuss further, assume a couple of sentences will be pulled from your email and forever represent you in that article. Choose your words wisely and keep it short and resourceful. My recommendation: a 1-3 sentence intro and 2-4 sentence pitch (or bullet points) makes it easy to sift through the important stuff. When planning your pitch don't forget the secret sauce: your #humblebrag. Many times, an outlet chooses you not just because of your expertise (especially if you are in a saturated industry) but because of your repertoire. Don't get obnoxious, though! Use your short introduction paragraph to namedrop 1-3 outlets you've been featured in, books you've authored, events you've spoken at, or awards received. Choose the biggest, most pertinent names to ensure the person receiving the pitch sees you are a sought-out industry leader. My name is [your full name] and I am a [insert industry and a title that matches their requirements] with [insert your experience]. I've been interviewed and featured on [namedrop], [namedrop], and [namedrop], and would love to share expert insight for your upcoming [media outlet] article. 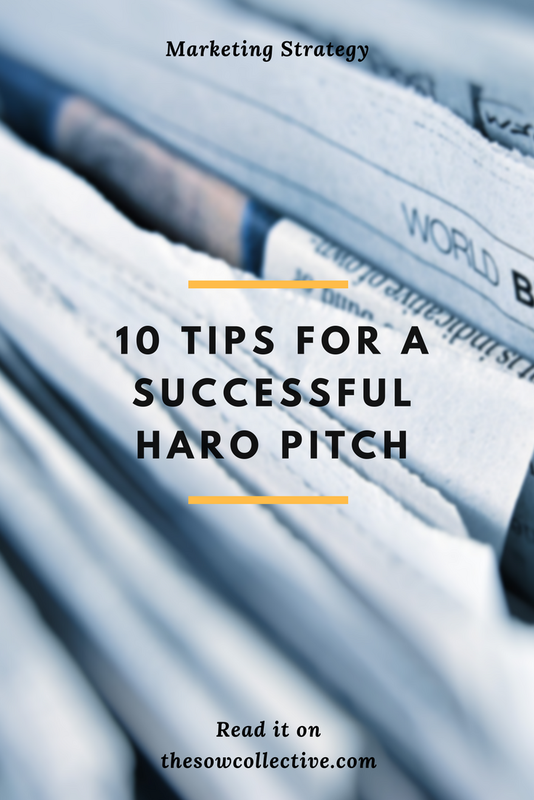 At the end of the day, you want to score a successful HARO pitch to further represent yourself as an authority. Don't forget to double check that your email signature and contact information matches your business. Make sure your name is displayed consistently (if you always include a middle initial in your work, present your name as such). Tell the reporter what to call you (designer vs. hobbyist / writer vs. blogger / expert vs. enthusiast) by introducing yourself in your pitch -- your title could make or break your chances just as much as the pitch itself. Include (hyper)links to your website and social media accounts; most articles will provide a do-follow link, though they never promise it. Here is an example of an article I was quoted in after I sent a pitch to a HARO query from Readers Digest. I quickly wrote it from my iPhone and never received a response. Weeks later I received a Google Alert and saw I was quoted in the article. Though it wasn't my favorite pitch (any travel expert would know my tips weren't rocket science), it was concise and unique enough to allow her to pull what she needed to publish her article -- and perfect for the Reader's Digest demographic. The pitch took minutes to write and now I can namedrop the media outlet! No, they didn't link to my website (bah humbug), but having Reader's Digest on my resume helped boost my authority as a travel expert for other, bigger projects. For a screenshot of the winning pitch, join the club - it's free! Avoid getting marked as spam, blacklisted, or flat out deleted from HARO by paying attention to the few, but important rules. Rule #1 - Do not attach anything to your pitch. It will be deleted to protect reporters from viruses. Rule #2 - Do not pitch a product if the query doesn't ask for it. Rule #3 - Do meet the requirements. If a query is looking for amazing cocktail recipes but requires certified bartenders, don't respond to tell them about the time you made cocktails at your NYE party. If you do not qualify for the article it is okay to move on. Rule #4 - Do follow the pitch instructions. If they ask for one sentence, then one sentence it is! Rule #5 - Do review all the HARO rules before pitching. Most of the successful HARO pitches I've sent never received a response. Thankfully, I use Google Alerts and get notified when an outlet mentions my name, website, or a number of other specific keywords. Be your business' strongest advocate and take the steps necessary to ensure you can celebrate press wins. What HARO categories did you sign up for? Did you find this HARO guide helpful? I hope these tips gave you some "Aha" moments and the tools needed to start churning out successful HARO pitches for your business and brand. Let me know what categories you signed up for and most of all, how it goes for you! About the author: Olivia Christine Perez is an award-winning marketer, digital content creator, and founder of The Sow Collective. Learn more or work with us to build your new business.